I’m glad my neighbours don’t mind me hanging out on their front lawns to take aurora pictures! I wanted to try a new location and my friend and neighbour Myrna said she wouldn’t call the police if she saw flashlights in her front yard late at night! Actually she came out to join our viewing of the lights as I was teaching another neighbour the basics of taking aurora pictures. It was so fun to share my passion and get someone else addicted to this hobby! One of the first pictures we took were as the lights started to spin and create a swirl, that was so cool! It is a new show each time I watch! The clouds started to move in but created an interesting effect. This shot shows the lights from the cottages on my street and the red light on the end to the right is my ‘favourite’ street light! I just can’t get away from it! I have been quilting and am almost done a large custom quilt but tomorrow I’m off to the Dauphin Quilt Show for the weekend so I’ll post that quilt on Monday! Hope you will indulge me as I share more Northern Lights photos with you as they were very active last night. I also wanted to test my new wide angle lens on the aurora and I am very impressed with the improvement of clarity and amount of sky captured! Now if only that damn street light ( the only one in our neighbourhood) would burn out! I hate that light with a passion as it creates a red glow on the trees and my house! So lets just pretend you don’t see it, okay! I wanted to get away from that light so my husband drove me to a local beach that faces north and I was able to take capture the aurora on a larger scale. I then turned my attention west and this was tricky as the highway is right there and when cars passed I had to wait to take the next picture. Then I caught a burst right above me! To get an idea of how fast they move each picture is exposed for 10-15 seconds. I just peeked outside….the aurora is starting up again so no sleep for me tonight! 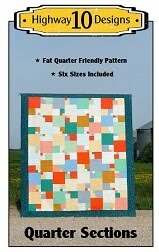 This is Yvonne’s Oversized Hopscotch quilt which is a pattern by The Quilt Patch. 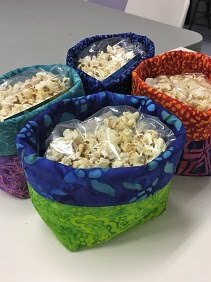 She purchased the flannel kit from Fabriculous and used Fireside for the backing. It will make a great cuddle quilt for our cold winters! I picked Spiral Square for the pantograph, used gold So Fine thread and Quilters Dream Blend batting. This is Cynthia’s Mahjongg quilt that she made in my Beginner Class back in 2014. She used beautiful batik fabrics in black, orange and yellow, it was a perfect time of year to get to quilt this quilt! I used the Mimosa pantograph, black So Fine thread on top and black Bottom Line on the back. The batting is Quilters Dream Blend. So I was again out in the dark playing with my camera the last couple of nights and my challenge to myself was to capture the Milky Way. I have been researching how to accomplish this and had a basic understanding of what setting to use. My only disappointment was the best time to capture the Milky Way in the Northern Hemisphere is in the summer! But I did manage to get a few pictures I am please with for my first try! I know I have a lot of room for improvement and that drives me to take better, more creative pictures next time! This first one I took from my next door neighbours dock and the light from the next yard created light that shows the colour of the leaves on the island. You can also see lights from houses further down the lake. I love that the lake was calm and I was able to get the brighter stars reflecting in the water. Then last night I took these one from a different part of our lake and I was happy to capture a meteor in this one which I saw zip above us. While we were waiting for the clouds to move off I experimented with backlight. I think next time I need to hold a quilt or drape one over the water level stick! Last picture of the night and Mars is heading towards the horizon and reflecting in the lake. If you haven’t stood under a dark starry sky in a while I highly recommend you find the time as it is the best way to clear your mind and enjoy the beauty that surrounds us. “We have also arranged things so that almost no one understands science and technology. This is a prescription for disaster. We might get away with it for a while, but sooner or later this combustible mixture of ignorance and power is going to blow up in our faces.” Carl Sagan. This is my second entry into the Bloggers Quilt Festival and this time I have entered my Butterflies quilt, a pattern by Laundry Basket Designs, into the Applique Category. I made this quilt back in December 2015 so my original post of it was in the snow. So I thought it would be fun to give it another photo shoot in the fall colours. I quilted the butterflies with a free hand feather and swirl motif. I then stitch in the ditch around each butterfly and pebbled the background to allow them to pop! The butterflies are fused down and then machine appliqued using smoky invisible thread with a blind hem stitch. I started to embroider the antenna but then changed my mind and just drew them on, very happy I did that! Hope your enjoying the Festival, the voting starts in three days and the festival runs until Sept 30. This is Cynthia’s Brick Wall quilt, she used a Tonga Treat and added a fun orange batik border. I used a pantograph I have not used in awhile, it’s called Tickle. 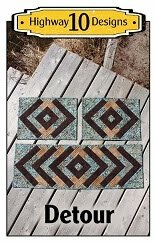 I find it looks great on batik quilts as it adds a swirly texture to the prints. I used a medium beige So Fine thread on top, a beige Bottom Line on the back, and Quilters Dream Blend batting. 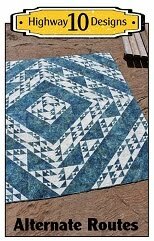 Welcome to those visiting from the Bloggers Quilt Festival, my name is Kathy and I am a longarm quilter living in Northern Manitoba, Canada. It is always hard to pick only two quilts to enter into the festival because I’m a Quiltaholic, the proof is here, because I love making quilts. No UFO’s for this quilter, I enjoy the whole process from picking the fabric to putting the last stitches in the binding and have to finish a quilt before starting another. It’s good motivation to be able to start a new project! I also love photography and this goes well with having a blog but I don’t just share pictures of quilts but of the beauty that is Canada’s north from the wildlife to the Aurora Borealis. I’m pretty obsessed with taking pictures of the Northern Lights and feel so fortunate to live where they are so active. Anyway I digress…you’re here for the quilts! 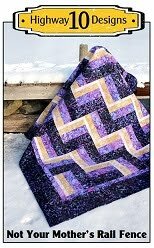 I am sharing my City Slicker quilt in the Large Quilt category for the Bloggers Festival. 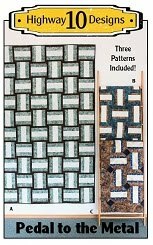 The pattern is one my friend Lori and I designed for our pattern company Highway 10 Designs, you can see all our patterns at our Etsy shop here. I used a Cantik Batiks Gemstone called Cassiopeia and a light batik for the background. I custom quilted a leafy feather in the background and used a diamond pattern in the colourful batiks fabrics. I used white So Fine 50wt thread on the whole quilt and Quilters Dream Blend batting. If you are a regular blog reader you will enjoy visiting all the other blogs entered into the Bloggers Quilt Festival so don’t miss out. To visit the festival click on the image below.